Having a baby comes with a lot of gear. Some of it you need, some of it you don’t. Some of it is useful, and and some of it just takes up space and collects dust. My wife and I spent some time researching baby monitors before our son arrived. 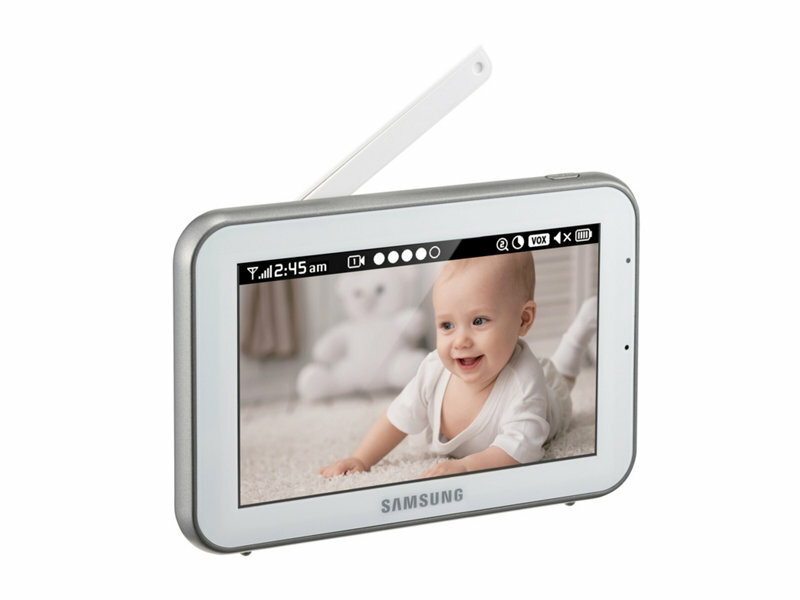 Luckily, someone made the decision easier by gifting a Samsung BrightView HD Monitor. We have had the monitor about 8 months now so it’s been in use long enough to form a couple of opinions. If you are are about to have a child or are hunting for a gift for a friend or family member that is, read on. Set up for this product is easy. I opened the box and pretty quickly discarded the instruction manual as I tend to do. After plugging the camera in and charging the monitor, things just seemed to work. I don’t recall having to pair the camera to the monitor, but I have since learned that pairing is very easy. The hardest part of the setup was finding a spot to put the camera so that we could get a full view of the crib. There is a little horizontal and vertical swivel on the camera, but the ranges aren’t very wide. If you are putting mounting a shelf for the camera, make sure you do it right the first time. Otherwise you’ll end up with a couple of extra holes in the wall like I have. The range on the monitor is decent, but not great. This is annoying, but also good because it keeps me responsible. My wife is a nurse and works over night at a hospital here in town. Usually after my son goes to sleep, I’ll step out on the porch with the baby monitor to read (just finished book 4 in the Harry Potter series, highly recommended!) for a little bit. If I go much further than my front porch, the monitor gives a little chirp to let me know I have strayed too far from home base, and the screen goes black. As soon as I step back, the picture comes back. This seems like a reasonable digital leash. The picture and sound are decent regardless of where I am. There are two things about this monitor that are slightly annoying. The microphone is really sensitive. We live in a town home neighborhood and people come and go randomly. If someone closes a car door too hard at night then the monitor picks that up. The screen flicks on brightly and illuminates my bedroom and I get to hear the door close in stereo. My other annoyance is around durability. We have dropped the monitor on hardwood floors a couple of times. As far as I’m concerned, that is the life of a device like this. I’ll go up stairs holding the baby, a bottle, and the monitor and something starts slipping. And inevitable the monitor takes a little bounce. After two drops, the monitor occasionally goes black or loses pairing. This is easily fixed by repairing the monitor with the camera. But in general, my opinion is that these devices should be a little more rugged. Overall, I’ll give this monitor a thumbs up, though I have nothing to compare it with. Although I wouldn’t call these monitors a necessity, if a baby cries you’ll probably hear it, they are nice to have and convenient.